People have criticised the children's TV show Peppa Pig after it referred to firefighters as 'firemen' in an episode called The Fire Engine. 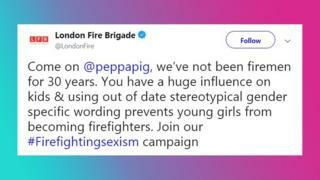 London Fire Brigade (LFB) posted a message on social media saying: "Come on @peppapig, we've not been firemen for 30 years. "Using out of date stereotypical gender specific wording prevents young girls from becoming firefighters." They say that language referencing firefighters as 'men' is sexist, when women can be firefighters too. Sexism is when somebody or a group of people are discriminated against or treated differently due to being male or female. Are BLACKPINK about to drop a new album? LFB is running a campaign called Firefighting Sexism to encourage more women to work as firefighters, as there are currently many more men in the profession. People have criticised the name of the programme Fireman Sam too, which was first shown on TV in 1987. They say that using language like this - especially in children's TV shows - encourages stereotypes. A stereotype is when people have fixed or oversimplified ideas about what something should be like - for example, that firefighters are men. Some have disagreed with the criticism though, saying that it is just a cartoon and it is not intended to be sexist, so it should not be treated in this way. It isn't the first time that the issue has been in the news. In January 2019, a mum took to social media to explain how her four-year-old daughter had said she wished she were a boy so that she could be a firefighter when she was older. This was because she thought only boys could do the job. "I've seen in books they are all boys," her daughter said. So lots of female firefighters responded to show her that there are female firefighters and to inspire her dream of joining the profession. 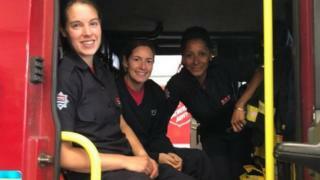 "We are London firefighters and we are girls. Hope we can meet you one day?" replied one group of firefighters based in Ealing, London. 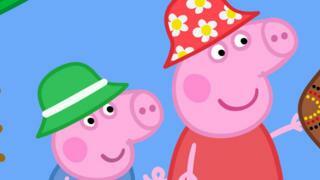 Newsround has approached the makers of the programme Peppa Pig to respond to what has been said. Gender Stereotypes: Why do shops divide products for girls and boys? Thx ( Thanks ) For your comment! I agree that the term ‘firemen’ is sexist in cerrain cases. For example, if you are talking about the whole fire department, it is sexist. On the other hand, if you see a male putting out a fire, you would natrually call him a fire man. Therefore, if you see a women putting out a fire, you should call her a fire women but when talking about a whole fire department, you should say ‘firefighters’. It is kinda funny you would have never noticed that if you watched the show.